The first fixture of the weekend saw Aston Villa take on Newcastle. It was a lackluster 0-0 draw. The high point of the match was the dismissal of Newcastle centre back Mike Willimson. Newcastle are having a tough time at the start of this new season having picked up 1 point so far out of a possible 6. However their opening game was tough, against the Champions Man City. This may be of concern to Alan Pardew and Newcastle, as the season before last, they almost faced relegation. There is also a danger that at this stage in the competition their new signings are proving ineffective. If this is the case, it is bad news for Newcastle as they will struggle this season if their new signings fail to affect their standings in May/June. Villa on the other hand, have had a different start to the league, getting 4 points out of a possible 6 so far. Things are looking good for Villa thus far. They have made some good signings, if they have the ability to keep this level of performance up, then I expect a respectable finish. The only other goal-less draw of the weekend was Southampton vs West Brom.The Saints had a tough summer selling many of their key players, including Shaw, Chambers, Lovren, Lallana and Lambert. They have done well to bring in players to replace the departed. New signing Tadic (left) has impressed so far for the Saints, however the same can’t be said for fellow newcomers Pelle and Long. Like Newcastle, Southampton only have 1 point from a possible 6. However, also like Newcastle, they had a tough opening fixture, this time against Liverpool; second place last season. West Brom having an average start to the season with 2 points out of 6. Their striker Berahino, (right) who scored twice last week against Sunderland, was kept well at bay by Southampton’s defence. This is good news as the Saints sold three key members of their back four in the transfer window. West Brom’s record signing Ideye, transferred for a record £10 million, has yet to make an impact for the Baggies. I worry slightly for these two teams. Although it is very early in the season, these teams seem to lack the class needed to make waves in this league. However, as I just said, it is very early days and all this could change. these transfers was Diego Costa (left) from Athletico Madrid. I rate Costa highly, but a friend said to me that because of his poor world cup showing, he would be a one season wonder. It is early days, but so far, the Spaniard has proved my friend quite wrong by scoring one goal per game. Courtois is another player to join Chelsea from Madrid, however, he is only returning from loan. The Belgian keeper (right) has proved invaluable for the blues and at one point against Leicester, made a great save to keep the game at 0-0. The Chelsea fans had more reason for glee as the Blues legend Drogba (below) made his return to Stamford Bridge. The star from the Ivory Coast replaced Costa on 80 minutes when the game was already won. Leicester on the other hand have been handed possibly the hardest start to the league. Everton, Chelsea then Arsenal. The new boys did well to scrap for a point against Everton, and against Chelsea they just failed to make their chances count. The challenges don’t stop as they face the Gunners next week. he struggling, managerless Crystal Palace were visited by West Ham. The Hammers were able to pick up their first win of the season in a very straight forward fixture. Palace need to find a new manager fast or this season could be a complete disaster. One player who impressed for the hammers was Zarate. The new man was an unused substitute for West Ham last week against London rivals Spurs. However, this week was invaluable, making darting runs, combining with Noble, and turning the Palace defence inside-out. If West Ham can continue finding superstars from thier bench, this could be an interesting season for them. For 83 minutes, Everton crushed Arsenal. There is no other way to describe the match. Arsenal were outclassed. Coleman put away Everton’s first, after nearly costing them the lead with a loose pass. Just before the break, Naismith scored a controversial second. Arsenal were done for. I don’t think that they deserved anything from that match, however, I do think that they showed great character to come back from 2-0 down to level the match. The Gunner’s flying Welshman; Aaron Ramsey started the comeback by scoring in the 84th minute. From that point on, Everton went on the defensive and Arsenal looked slightly more dangerous. In the 90th minute, Giroud scored the equaliser to get Arsenal a point from the fixture. Arsenal were a great disappointment. However, I admire the character they showed to grab a point from the fixture. Everton on the other hand are a grate side, and will be under great pressure to build on the great performances they produced last season, and are yet to grab a win. Hull this week entertained Stoke. I like the Team that Steve Bruce has built, and am confident that they will be in the Premier League for a while. However, Bruce’s men were stricken with an early setback as Chester was sent off after 14 minutes. Despite this setback Jelavic put the Tigers ahead just before half time. Despite this, Shawcross managed to eaqualise for Stoke on the 83rd minute. Stoke have only picked up 1 point out of a possible 6, and their transfers haven’t been great, and therefore I worry for them this season. Hull on the other hand have picked up 4 out of 6 points so far. As I said earlier, they will be in the Premier League for a while. Last year, Man Utd suffered a terrible season. They have since placed their trust in van Gaal to save their club. However, after two matches, the Red Devels are still without a win. Mata struck first in the 17th minute, only to have his goal cancelled out by Rodwell in the 30th minute. I now worry for United. After 2 games, they only have 2 points. This is not the look of a team that under a different manager, were big title contenders. Sunderland on the other hand look even worse with only 1 point from a possible 6. 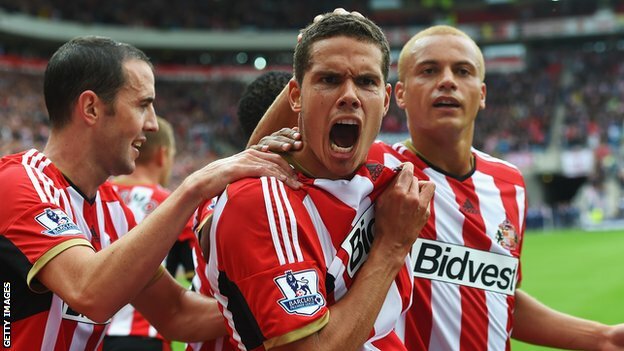 Their only good signing has been Rodwell. Relying on one signing is a dangerous move. The big match of the season. Last season’s winners vs Last Season’s runners up. It was one of the signings from last season that came through for City. Jovetic was on form scoring twice, and Aguero bagged the third. Liverpool on the other hand didn’t even score the goal. It was an unfortunate own goal scored by Zabaleta. Both teams will be at the top this season with Chelsea, I will be interested to see who comes out on top. I think it could be between City and Chelsea this season. Liverpool were outstanding last season, and quite a lot of their success was down to Suarez. They have since been replace by Mario Balotelli from AC Milan for a fee of £16 million. However, Balotelli wasn’t even on the bench against his former club, but because of the sheer power of City’s side I don’t think he would have made much of an impact. Harry Redknapp returned to White Hart Lane only to be destroyed by the monster he created. Spurs crumpled and tossed his QPR team to one side as they romped to a 4-0 win. Part of this was down to a well orginised Spurs side, in which Nacer Chadli and Adebayor (left) shone. However, it could also be down to a poor showing by Rob Green (below). Green was on poor form letting in 4/5 shots on target. Dier got the final goal for Spurs. That is 2 goals in 2 appearences for the new man. Impressive. At current, Spurs sit at the top of the table. However, I see Spurs at the top of the table, like I would see an elephant at the top of a tree. I don’t know how it got there, but it’s gonna fall down soon enough. who had the best chances of the match. After this fixture, Burnley are still part of the 0 points club. Swansea on the other hand are tied for the lead of the table. I will enjoy seeing their progress over the season as they have built a very competitive squad.